With Trevor Noah‘s absence following a respiratory and ear infection, South African TV Girl, Bonanag Matheba was announced as his replacement to host the 2016 MTV MAMAs. 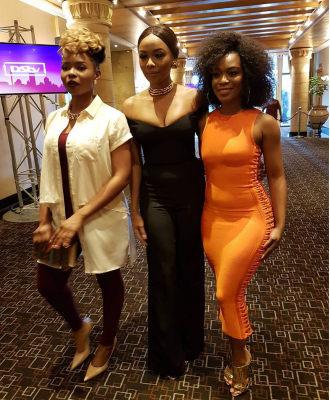 Bonang will now be joined by two more African stars; Yemi Alade from Nigeria and Nomzamo Mbatha from South Africa. Together, the trio have been tasked with the mission of delivering their best on the biggest night for African Music. The live two-hour telecast of the event will take place at the Ticketpro Dome, Johannesburg on October 22, 2016, with performances from African stars like Alikiba, Babes Woduma, Cassper Nyovest, Nasty C, Wizkid and Ycee.